Dublin city councilors have called on city officials to revise a plan to change the Point Village roundabout into a signalised junction. At the monthly meeting of Dublin City Council, councillors said they hoped the plans could be improved for walking and cycling. “What we have on front of us [the current part 8 plan] is an improvement from the previous version, I still think it does not go far enough to meet the needs of all road users,” said Cllr Ciaran Cuffe (Green Party). He said that it was not “appropriate in this day and age” that pedestrians would have to press a button and wait three times just to cross the street from the riverside to the Point Village, where there is a Luas tram stop, a cinema, and the Three Arena venus. People cycling from the Liffey Cycle Route would also have to use the same share walking and cycling crossings, stopping three times to cross one street. Cllr Éilis Ryan (The Workers’ Party) said: “Junctions where people have to stop three times to cross the road is uncommon in Dublin and a dangerous direction to be talking the city in… I think it is a serious enough problem to delay the procedure. IMAGE: The replacement for the Point roundabout, which also including widening East Wall Road to include a new wide traffic lane, but mixes walking and cycling at a number of points. He said that he and others had looked for pedestrian improvements three years ago and that the council only getting as far as planning stages in three years was “an indictment of how we do our business”. He said the three crossings were not great but that there was a need to improve the junction so he was in two minds delaying any improvements. “We need to also bear in mind that there’s very dramatic plans for the development of the area and we are going to have a huge influx of pedestrians and cyclists,” said Cllr Binchy. 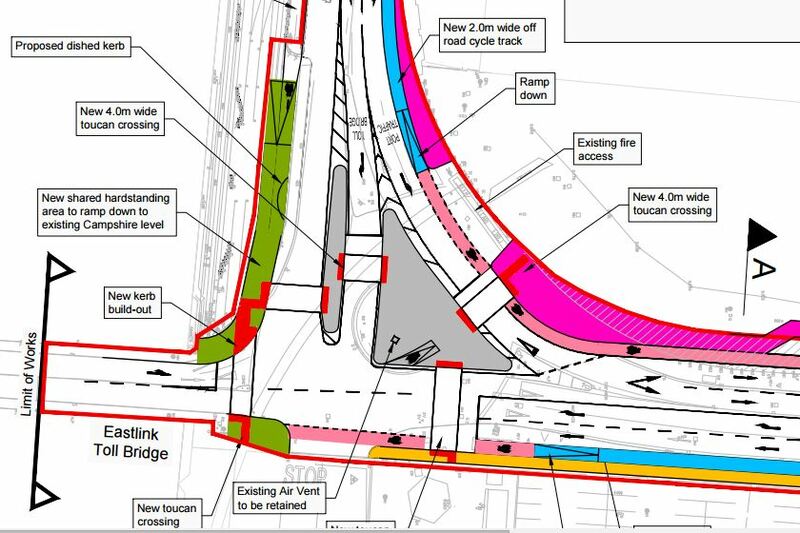 IMAGE: The post-public consultation design includes a new indented layby where cars will cross a cycle lane into the layby. However, shared walking and cycling space is kept with no indent for a bus stop bypass which would give walking and cycling their own space. 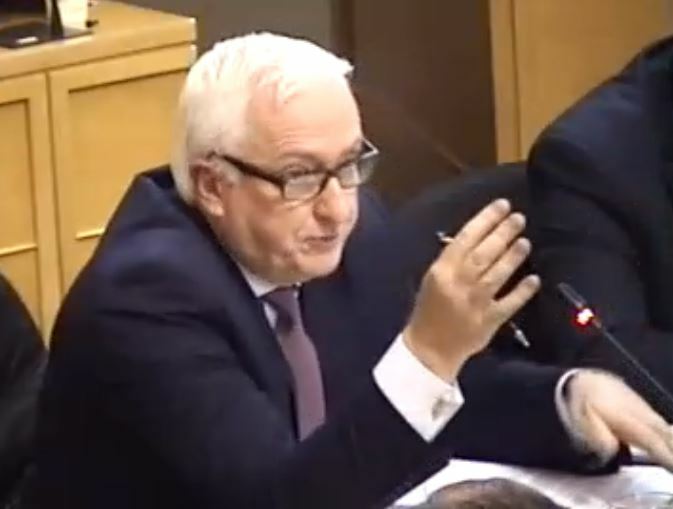 Cllr Mannix Flynn (independent) said it was worth postponing a decision for a month and he highlight the poor condition for walking and cycling on the East Link Bridge. Cllr Paddy McCartan (FG) noted that there was little mention of pedestrians in the Part 8 report, while Cllr Andrew Montague (Labour) also backed the deferral, requesting improvements for pedestrians. Cllr Ray McAdam (FG) said the proposal is “far from perfect” but he was concerned that a deferral would effect the statutory process as public consultation had already happened and asked for the manager’s advice on this. City official Declan Wallace, acting director of traffic, said that the process of approval needed to be completed by February 17. “We’re dealing with a very serious north-south corridor, we can’t go from being pro-car to being pro-pedestrian and cyclist in one go. This is a huge step forward and in the fine tuning of the final design it may be feasible to tweak the pedestrian crossings, not to maybe have them staggered, but other than that there’s very little room… there’s very few thing that can be done that have not been explored,” said Wallace. Councillors voted to defer the approval for one month, with 33 voting for the deferral, 9 against and 4 abstained. What does the national guidance say? While Wallace said “we can’t go from being pro-car to being pro-pedestrian and cyclist in one go”, the Manual for Urban Roads and Streets takes a different view: “Designers must take a more balanced approach to junction design in order to meet the objectives of Smarter Travel (2009) and this Manual.” The manual was jointly published by the departments of transport and environment and is a mandatory document which councils must consider. The same section of the manual continues: “In general designers should: Omit left turn slips, which generally provide little extra effective vehicular capacity but are highly disruptive for pedestrians and cyclists. 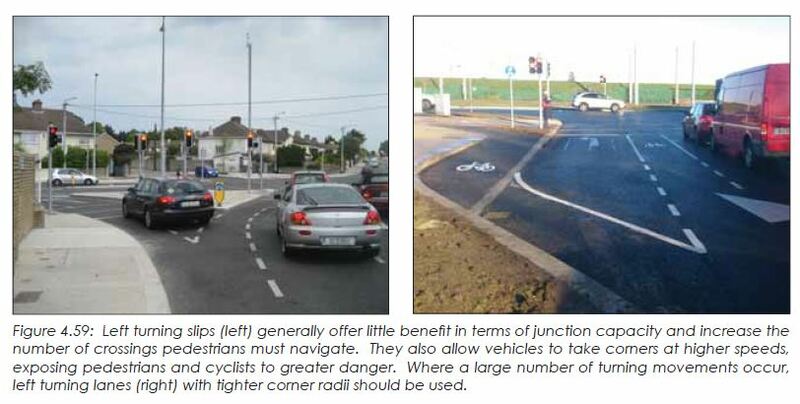 Where demand warrants, they may be replaced with left tuning lanes with tighter corner radii (see Figure 4.59, below).” and to “Omit staggered crossings in favour of direct/single phase crossings”. It is unlikely that the people who cycle on the East Link Bridge, mixing with HGVs on narrow lanes, will choose to take up the options of joining pedestrians on shared footpaths, so some people cycling will be exposed to both of the wides ends of the slip lane. IMAGE: An example from the Manual of Urban Roads and Streets where traffic lanes can be a max of 3.5m. 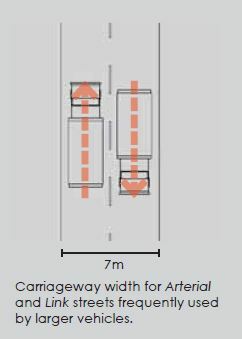 The manual says that “The standard lane width on Arterial and Link Streets should be 3.25m” but adds that “Lane widths may be increased to 3.5m on Arterial and Link streets where frequent access for larger vehicles is required, there is no median and the total carriageway width does not exceed 7m.” The planned carriageway at East Wall Road is over double that at 14.3m. However, the general widths of the traffic lanes on the project are between 3.4m and 3.5m, and the new inside northbound traffic lane is planned to be 4 metres on East Wall Road — far exceeding the general 3.5m width of lanes on the M50 which has a 100km/h speed limit and carries more traffic and trucks than the East Wall Road. CORRECTION: The above article originally wrongly the identified city official Declan Wallace (acting director of traffic) as another official. The error was fixed a short time after 11.30am on the date of publication, which was soon as possible once we were alerted to it, and this correction note was added a short time after. It was caused by following the name supplied in the public record of the Dublin City Council webcast system, but, in any case, IrishCycle.com apologises for the error and any confusion caused. The error is now corrected. The phrasing “mandatory to consider” does unfortunately seem to imply “… and, having considered, then dismiss”. I use the East-link. At least with the new proposal pedestrians now have some way to get across the roads. At the moment there’s nothing for them. It’s unbelievable. The proposed design leaves a lot to be desired however. Motor-traffic is still being prioritized above all. As someone who cycles, I don’t like the look of that new slip-road design for motor-traffic coming from the Quays onto the East Wall Rd. Depending on the finished design, it could encourage some motorists to barrel onto the East Wall Rd to get ahead of motor traffic coming straight from the bridge. When motorists are looking out for other cars as their priority then they tend to be blind to non-motorised traffic, especially during hours of darkness. That proposed slip-road could become very problematic, unless some type of dampener is put on motor speed – such as very aggressive speed calming devices being built into the road. Bumps and knobbles in the road perhaps? Is there any plan to add cycle lanes to the East Link bridge? …and is this a typo: “Wallace, acting director of dreadful”?! This is what’s behind catering primarily for free-flow movement of motorised traffic. Let’s be quite clear, this is one of the most HGV- and coach/bus-rich corridors in the city and since we know that 4-axle and semi-trailer trucks did most of the maiming and killing (yes, killing!) of cyclists during the construction boom days the city has to make sure that it’s design standards and the required road safety audits reflect that reality. I am calling on the City to publish, in public, each stage of its road safety audits for this scheme. The audits need to be undertaken by an independent consultancy. National design guidance must be conformed to. Why is the East Link bridge not an integral part of this scheme? It needs to be made a lot safer for both cyclists and pedestrians as others have pointed out. The East-Link bridge itself is a horrendous design. Whoever designed it was thinking solely about motor-traffic. And who the heck signed off on it in planning? To say that it’s hostile to non-motorist users is an understatement. How about adding a Liffey boardwalk type structure on one side of it to better facilitate cyclists and pedestrians (non-mixed of course!). However, I don’t know whether that would be feasible given that it’s a moving liftingbridge. One of the worst designs I have ever seen. There is plenty of space there for a balanced solution. It’s all down to the the attitude of the officials.